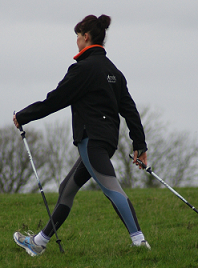 We offer Nordic Walking Taster Sessions lasting approximately 1 hour – poles are supplied by us. All you need to do is: find out when and where the next NW Taster Session is and book your place click here for quick link to contact us. Taster Session completed and enjoyed! and you’re excited to learn more, then sign up for one of our training Programmes with East Devon Health & Fitness qualified instructor. … with East Devon Health and Fitness. Here you will learn, in 2 x 2 hour sessions, to build your knowledge and technique, leading to your further enjoyment of Nordic walking, and at the conclusion of your training and understanding of the technique you will then be welcome to join in as part of an East Devon Health and fitness Nordic Walking group. … with a qualified East Devon Health and Fitness Walk Leader. For continued enjoyment and all round benefit we offer at least 3 walks per week through out the year. Walks are of varied style and length to accommodate most walking needs; venues are all over East Devon; with a repertoire of over 150 walks exploration of our beautiful countryside, is an inevitable addition to our walks together. Remember to do your post exercise stretches click here to see the “how to” pictures why not print them off to use as an aide memoir. East Devon Health and Fitness offer a range of services aimed at promoting health and well-being. Our key services are: Personal Training, Nordic Walking, Pilates and Sports Therapy. A great summer a great year!